BOGGS, Thomas Hale, Sr., (husband of Corinne Claiborne Boggs), a Representative from Louisiana; born in Long Beach, Harrison County, Miss., February 15, 1914; attended the public and parochial schools of Jefferson Parish, La. ; was graduated from Tulane University, New Orleans, La., in 1935 and from the law department of the same university in 1937; was admitted to the bar in 1937 and commenced practice in New Orleans, La. ; elected as a Democrat to the Seventy-seventh Congress (January 3, 1941-January 3, 1943); unsuccessful candidate for renomination in 1942; resumed the practice of law in New Orleans, La. ; enlisted in the United States Naval Reserve in November 1943; was commissioned an ensign and attached to the Potomac River Naval Command and the United States Maritime Service until separated in January 1946; again elected as a Democrat to the Eightieth and to the thirteen succeeding Congresses; chairman, Special Committee on Campaign Expenditures (Eighty-second Congress); majority whip (Eighty-seventh through Ninety-first Congresses), majority leader (Ninety-second Congress); disappeared while on a campaign flight from Anchorage to Juneau, Alaska, October 16, 1972; served from January 3, 1947, until January 3, 1973, when he was presumed dead pursuant to House Resolution 1, Ninety-third Congress. Papers: In the Hale and Lindy Boggs Papers, 1941-1991. Partially processed. Oral History: 1969, 49 pages. Interviews conducted with Hale Boggs by T. H. Baker on March 13 and 27, 1969. The transcripts are available in the library and online. Oral History: 1964, 39 pages. Papers: In the Katie Louchheim Papers, ca. 1906-1991, 34.5 linear feet. Correspondents include Hale Boggs. A finding aid is available in the library. Papers: 1963, 1 item. A signed typescript of Hale Boggs's speech relating to the assassination of President John F. Kennedy and describing the arrival in Washington, D.C. of Air Force 1 with the President's body. Also described are senior members of Congress who met Air Force 1 and Hale Boggs's first meeting with President Lyndon B. Johnson. Papers: 1964, 21 items. Correspondence consists of letters from United States diplomatic personnel and Latin American political figures concerning a report made by DeLesseps S. Morrison about the Louisiana Trade and Good Will Mission to Latin America. Letters express condolences on the death of DeLesseps Morrison. Balias, Scott E. "The Courage of His Convictions: Hale Boggs and Civil Rights." Ph.D. diss., Tulane University, 1993. Boggs, Hale. "Executive Impoundment of Congressionally Appropriated Funds." University of Florida Law Review 24 (Winter 1972): 221-9. Boulard, Garry. The Big Lie: Hale Boggs, Lucille May Grace, and Leander Perez in 1951. Gretna, La. : Pelican Pub. Co., 2001. Eggler, Bruce. Life and Career of Hale Boggs. New Orleans: States-Item, 1973. Engstrom, Richard L. "The Hale Boggs Gerrymander: Congressional Redistricting, 1969." Louisiana History 21 (Winter 1980): 59-66. Gibson, Dirk C. "Hale Boggs on J. Edgar Hoover: Rhetorical Choice and Political Denunciation." Southern Speech Communication Journal 47 (Fall 1981): 54-66. Kirn, Dorothy Nelson. "Hale Boggs: A Southern Spokesman for the Democratic Party." Ph.D. diss., Louisiana State University, 1980. Ralph Nader Congress Project. Citizens Look at Congress: Hale Boggs, Democratic Representative from Louisiana. Washington, D. C.: Grossman Publishers, 1972. Solomon, Burt. The Washington Century: Three Families and the Shaping of the Nation's Capital. New York: William Morrow, 2004. United States. 93d Congress, 1st session, 1973. 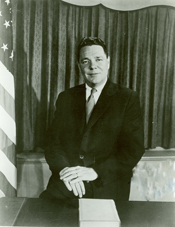 Memorial services held in the House of Representatives and Senate of the United States, together with tributes presented in eulogy [of] Hale Boggs, late a Representative from Louisiana. Washington: U.S. Government Printing Office, 1973.